Sequence Transmitter for the 12 Cue Distributed Firing System, 4 Cue Distributed Firing System and individual 1 Cue Receivers. 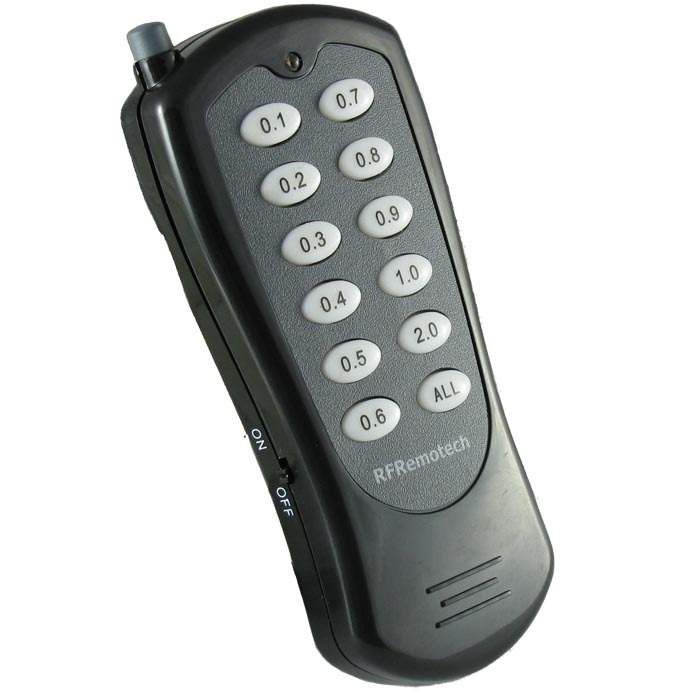 This optional transmitter allows up to 12 delays to be inserted between the receivers for an automatic sequence run. Size: 115 x 50 x 15 mm. Power: A23 12v battery (included). Range: 200m line of sight. 0.1, 0.2, 0.3, 0.4, 0.5, 0.6, 0.7, 0.8, 0.9, 1.0, or 2.0 seconds between receivers. This is ideal for effects spread out over a large area as it eliminates long lengths of wire. This is a 4 Cue wireless firing system for firewor..
12 Button Transmitter identical to the one distrib..